3/9/60: Loaned to Handley Page for SBAC display at Farnborough. 17/6/63: Handley Page for mods (conversion to B2R). 10/10/68: Handley Page for storage. 3/6/70: Hawker Siddeley Woodford for K2 conversion. 18/8/80: RAF St Athan for major servicing. 12/11/80: 57 Sqn. RAF Marham. 10/6/83: RAF St Athan for major servicing. 31/8/83: 57 Sqn. RAF Marham. 20/3/86: 55 Sqn. RAF Marham. 26/6/87: RAF St Athan for major servicing. 3/11/87: 55 Sqn. RAF Marham. 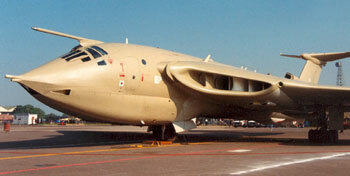 Update from Pete Cross: I was on 55 Sqn when XH669 diverted to Waddington in June 1990. Your web site states that it had an engine fire causing it to make an emergency landing at Waddo. It wasn't an engine fire, it was a hot air leak from one of the inboard engines that caused damage to the flying controls. Definitely not an engine fire. 12/5/95: Aircraft scrapped. Nose section removed for restoration. Aim of restoration: To restore the cockpit of XH669 to K2 standard. Instruments, morse key, refuelling nozzle, squadron patches, Victor Aircrew t-shirts, Victor B1 and B2 Pilot's notes, a copy of Blue Spear the Movie, aircrew equipment and flying clothing, photographs or videos of XH669 in service. The following photograph has been kindly provided by Keith Saunders and it shows XH669 in the early 60's. It is believed to be at the Farnborough Airshow either in 1960 or 1962. Can anyone confirm please?